“Honey, this drink is a miracle!” I proclaimed last night in a volume that was perhaps just a smidge too high. “One drink and you’re set—you’re set!” Apparently I was pretty set already, because I needed my husband to point out that becoming inebriated after drinking 4 ounces of hard alcohol over the course of 15 minutes did not constitute a miracle. Four ounces of alcohol, it turns out, is the equivalent of close to 3 beers, and I’m a 2 beer per night kind of girl. While it may not be a miracle in the strictest sense (or even the common usage sense), this little angel of a drink still reaches divine status in my book. The recipe is mostly borrowed. It’s a poor man’s Mark Bittman margarita, made a bit dirty to cut the sweetness. When I first made it, it took me forever for some reason, but now I have it down to a science. I’m including all the details so you can zoom through the prep work to the fun part. Pour a bit of coarse salt on a small plate and set aside. Pour 3 ounces of tequila into a liquid measuring cup. Add the ounce of Cointreau. Cut a lime into quarters. Squeeze the lime sections into your measuring cup until your entire drink is up to 5 ounce mark; reserve one of the squeezed sections for later use. Check your measuring cup as you go, as sometimes you won’t need the use the whole lime. If on the other hand one lime does not produce enough juice, you can either cut up another lime or be lazy and figure it’s good enough. Your call. Add a teaspoon of juice from your olives and stir. Drop a bunch of ice cubes into your measuring cup. Rub the rim of your martini glass with your squeezed lime section, turn your glass upside down, and rotate the rim in the coarse salt. (If you think you don’t like salt with your margaritas, try it here. Since this drink is strong and not sweet, the salt is actually quite helpful.) Put your olives on a toothpick and add to your martini glass. Use a big spoon to hold the ice back while you carefully pour your drink from your measuring cup to your glass. Here’s the poor man’s trick: I use a substitute for tequila called sotol, a Mexican spirit similar enough to tequila for my taste. I had never heard of sotol until a couple of years ago, but a quick online search tells me it’s gaining in popularity, perhaps for the very reason I chose it: If you buy sotol, you can get alcohol of a much higher quality for the same price as a lower quality tequila. The brand and type I’ve settled on is Hacienda de Chihuahua’s Sotol Reposado. Yum! Poor man’s trick #2: I substitute a less expensive but still highly rated orange liqueur for Cointreau: Bauchant Liqueur Napoleon. If you can afford it, spend a bit more for some quality olives. They play a key role! Store the alcohol in the freezer so that it will be as cold as possible when you make your drink. If you plan on making these in quantity, definitely invest in some sort of tool to help you squeeze the limes, preferably one that plugs into the wall. I once made pomegranate margaritas for a party and spent the entire night in the kitchen squeezing limes by hand. Not that fun actually! Update 7/5/11: My friend Theresa called me last week to tell me she made my Mexican martinis, and to report that they are ALL ALCOHOL! This prompted me to think that perhaps I should update my blog post to point out that these drinks are indeed very strong (hence their miracle qualities). In my defense, this is a standard ratio for a margarita that you will find in many recipes, it’s just that we’re so used to the watered-down/sugared-up versions sold in most restaurants that we aren’t prepared mentally for the real deal. In Austin, a local Tex-Mex restaurant named Trudy’s is known for their Mexican martinis. I had one last night just to check out the competition. Less strong, definitely, and sweeter. The waitress told me they added a splash of orange juice, but I’m thinking there may have been a “splash” of something else too. 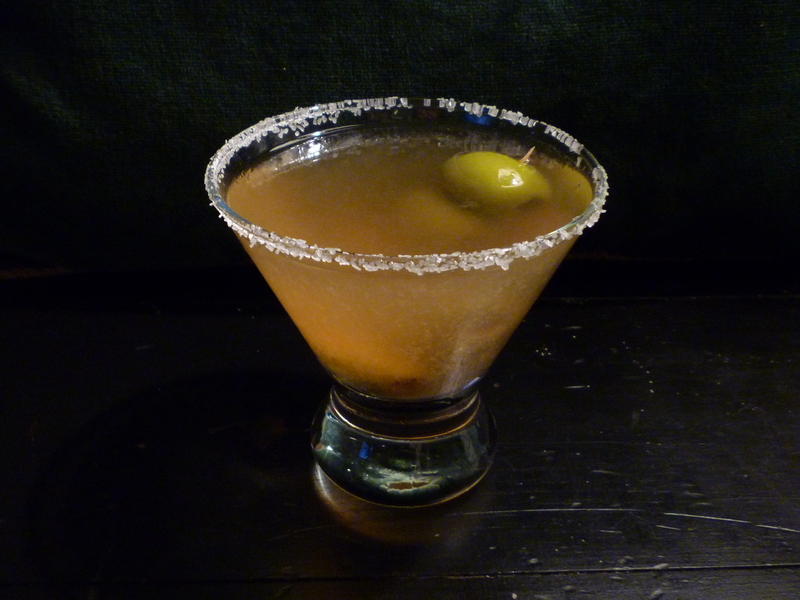 This online recipe for Trudy’s Mexican martinis claims they add Sprite as well. I see others that say sweet and sour instead. I asked our waitress if they added Sprite, and she said no, but she might not know, since she wasn’t the bartender.